Construction of the Fairlawngig core network is now complete. 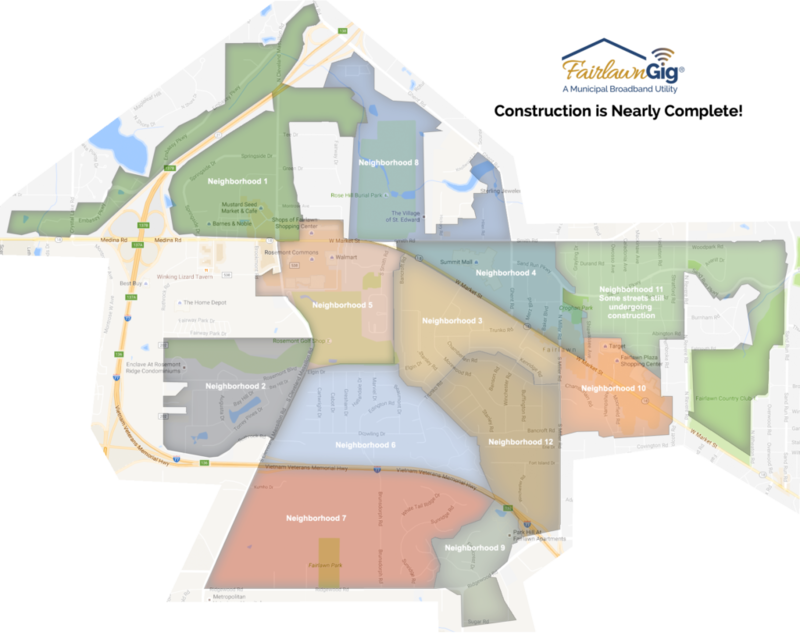 The only places within Fairlawn where we can not deliver service are Park Hill Apartments and Lawnfair Apartments. FairlawnGig does not have permission from those building owners to bring FairlawnGig fiber into those properties. If you are a resident of these apartments and are interested in getting FairlawnGig Internet, please contact your apartment manager. There is a multi-step process to get your home connected. The process includes bringing fiber from the street to your house and indoor installation of the equipment needed for FairlawnGig service. We’ve outlined the residential installation process to help you understand how it will work from this point forward. Now that the main network construction is complete, we are working as fast as we can to get customers connected. FairlawnGig has an installation plan in place that makes the most efficient use of our installation and construction crews to expedite the installation process. If you are a Fairlawn resident, you can schedule installation. On the date and time that we scheduled your install, a two person crew will come to complete your installation of the indoor install and service activation. We have installation details here if you’d like to know more. You can reach us at 330-668-3300 or email support@fairlawngig.net. You can also email us directly from your FairlawnGig account portal here. All streets in Fairlawn are ready for installation. The fastest way to get service is by calling us at 330-668-3300 to get on the installation schedule. Thank you for support and patience throughout the construction process. We look forward to connecting you! If you haven’t yet signed up for service, please do so here.